Whip up my pancake recipe for fluffy, chef-tested buttermilk pancakes any time of the day. People often try and replicate the fluffy, soft buttermilk pancakes that come from a box pancake mix. I’m going to do you one better and show you how you can make your own homemade dry mix and get the same results. 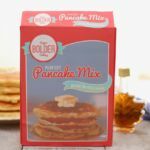 You’ll be able to make homemade pancakes in no time and even have a dry mix you can use anytime. If you’ve often wondered how to make pancake mix, you’ve come to the right place. I’m no stranger to Buttermilk Pancakes. I used to have a catering business where I specialized in over-the-top breakfasts. The winning combination of dry ingredients in my Best Pancake Recipe will store well and be ready for baking any morning, afternoon, or late at night. My most popular breakfasts were on Fridays where I would make crazy pancakes and waffles. My Buttermilk Pancake recipe was one of my most popular dishes. I was also known for my Red Velvet Pancakes and Churro Waffles. If you are a breakfast aficionado, you will really enjoy these pancake recipes and waffles. They’re far from average and no one will blame you if they become your favorite meal of the day. Looking for more homemade mixes that are better than store-bought? Get my Homemade Dry Cake Mix recipe. Don’t forget to check out all the Bold Baking content on YouTube, too! To make the pancake batter: Whisk together the buttermilk, eggs, oil and vanilla extract, if using. Add the liquid to the dry mix and starting lightly mixing together. The secret to thick, fluffy pancakes is not to over mix. Lumps are ok, resist the urge to mix more. Put a heavy bottom frying pan or griddle on medium heat-low heat. Spoon one big spoon of the batter per pancake. Cook for roughly 4 minutes on one side. It is time to turn them over when you see bubbles forming on the top of the pancake and the edges turn color (forming bubbles on top is really important because they hold your pancake up and keep it thick, I call them pancake pillars. Flip and cook on the other side a little longer, until brown. Enjoy with butter and maple syrup. can i make the batter and store in the refridgerator til i need it? This is one of the best pancake recipes ever! Gemma, can I use this delicious recipe to make waffles instead of pancakes? Thank you. You can make as few as you wish, or you can make a batch and freeze. This batter will make 8 pancakes. You can divide it down, that is just math, but the egg will be the issue if you wish to retain that. If not you can use yogurt in this batter, a Greek/strained natural yogurt will do it. You could also just add an egg yolk for the nutrition and to enrich the batter. I hope this helps, you will need to write the recipe out and be careful to divide every ingredient. Gemma,these were the best pancakes we ever had! Fluffy,, fluffy,,fluffy,,,Your recipe are the greatest. Thanks for the recipe and the tips! ❤️From Newfoundland! I can’t believe I made buttermilk.!!! They were so fluffy n the taste was so fresh n love the hint vanilla.. I added blueberries to mine. Thank you! Best ever! YUM, blueberry pancakes are my favorite! Great job! I hate wasting anything so I have gotten in the habit of using dry buttermilk in recipes. Not only do – not waste buttermilk but I always have it on hand when I need it! I usually store it in the fridge once it’s opened so I would store the pre-made pancake mix in the fridge also…. I can’t use that many pancakes at once. How can I use 1/4 of the recipe, that is mixing all the dry ingredients as ststed, but only 1/4 of it at one time. It’s difficult to use half an egg. Yes, you can 1/2 this recipe. I agree it is difficult to 1/2 an egg, unless you are using it for something else. You can also substitute the egg for yogurt, that will also work, not as rich, but good too. You could use flax egg too (https://www.biggerbolderbaking.com/egg-substitutes-for-baking/) this chart will help. Mix the batter to a nice stiff consistency, then rest it, ten minutes or so will do it, that is really important for this type of recipe. what would need to be changed for waffles? I love these!!!! Really hardly any difference. Increase the butter by about 1/2 ounce/15g/1 tablespoon of butter. This is what changes the texture to give a light airy finish. Try it! Gemma, these are absolutely FANTASTIC!! I topped them with sliced bananas & finely diced pecans, little butter and syrup. Will definitely be making these again, also I cooked them on a flat griddle! I LOVE LOVE LOVE to hear that, Kristina!! Make sure you save the recipe for you have it for the future. Oh the recipe is saved! Making a batch right now! Hi, great question. Yes you can but the raising agent will be activated keeping it from raising fully when cooked. I might suggest pre mixing the we and dry ingredients then mixing them together in the morning if you want to save time. Enjoy! Hi Gemma. My son loves pumpkin pancakes. Can this base recipe be used to make pumpkin pancakes? My son will be home on leave from the Army and I would so love to make these for him? Please advise. Thanks. hum I would recommend used an actual pumpkin pancake recipe. I’ll see if I can do one in the next few weeks.